Exercise places a series of competing demands on the human body. First, as muscles work harder, they require a larger blood supply. This entails a whole-body shift: Blood vessels in the periphery widen to accommodate more volume, and blood vessels in the gut contract, forcing even more blood out to the muscles. To keep this volume circulating, the heart pumps faster and ejects more volume on each stroke. To maintain the supply of oxygen and remove carbon dioxide, the rate and depth of breathing also increase. The sympathetic branch of the autonomic nervous system plays a significant role in all these changes that allow us to exercise. But how does the autonomic nervous system know that the body is exercising? What signal tells this system to execute such significant changes? Perhaps it is our conscious perception of the fact that we are exercising, or perhaps some receptor in our muscles tells the autonomic nervous system that the muscles are active and need more blood. In fact it is a combination of these concepts. Three systems, known as central command, the baroreflex, and the exercise pressor reflex, mediate the autonomic response to exercise. My Heart Knows When to Beat Faster: : How the Human Body Anticipates its own Needs During Exercise . Willms, Joanna . Lethbridge Undergraduate Research Journal. Volume 4 Number 1. 2009. A student laces up her running shoes at the base of a long hill. As she sets off on her run, her heart rate begins to increase. She breathes deeply and starts to feel the strain when the hill becomes steeper. Thirty minutes later as she reaches the top, she is breathing fast, her heart is pounding, and she is drenched in sweat. Many physiological changes occurred while she ran. In addition to the easily apparent changes just described, her digestion slowed as blood was distributed to working muscles, her kidneys produced less urine, and her liver released glucose into her bloodstream (Widmaier et al., 2006). Many of these changes were orchestrated by the autonomic nervous system – but how did the autonomic nervous system know exactly when to make these changes? In a recent review, Williamson et al. (2006) introduce three systems that send instructions to the autonomic nervous system: in their words, “it is well accepted that central command, the exercise pressor reflex, and the arterial baroreflex are all involved in mediating the characteristic cardiovascular and haemodynamic adjustments to exercise” (see Fig. 1). In other words, these three systems provide the input that allows autonomic activity to vary with exercise intensity. During exercise, a large blood volume must go to active muscles. This blood supplies oxygen and removes wastes. Various physiological adjustments accomplish this redistribution of oxygenated blood. In all forms of exercise there is an increase in blood pressure, rate and force of heart contractions, and rate and depth of breathing. The autonomic nervous system influences all of these parameters (See Fig. 2). 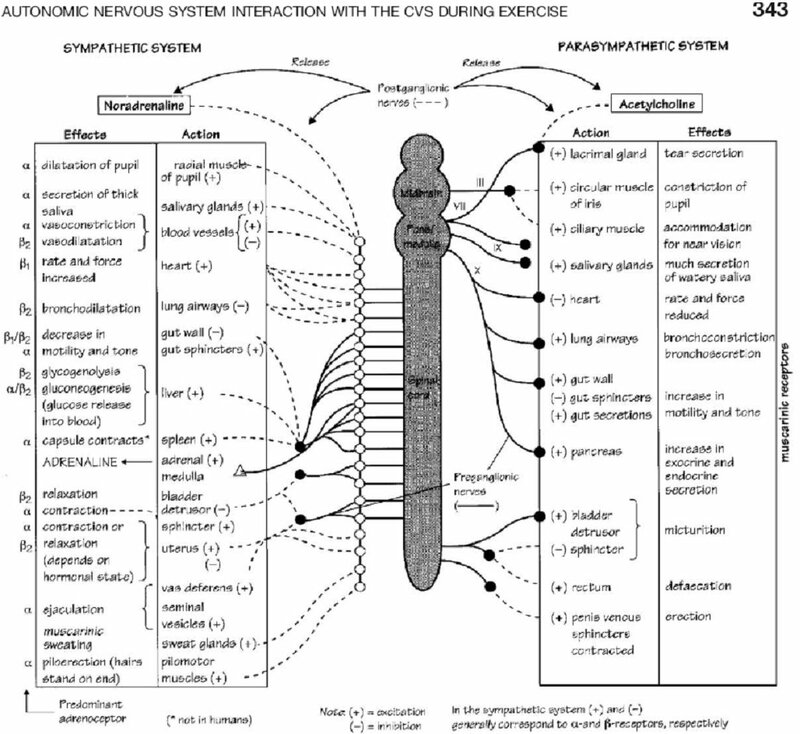 The sympathetic branch of the autonomic nervous system is the most influential during exercise. Sympathetic activity, encompassing a wide range of physiological adjustments, increases in proportion to exercise intensity. Both feedforward and feedback control act to maintain a match between sympathetic activity and the level of exercise. Central command, the baroreflex, and the exercise pressor reflex are essential components of this regulation. Regulation by central command involves the brain making an educated guess of the amount of sympathetic activity required. A network of brain structures makes this guess based on how many muscles are active and on the person's subjective feelings of exertion. According to the traditional definition, central command is “a feedforward mechanism involving parallel activation of motor and cardiovascular centres” (Williamson, Fadel, & Mitchell, 2006). The logic of this mechanism is clear: when the brain activates spinal circuits that control leg muscles, it anticipates that those muscles will soon need more oxygen. Accordingly, a network of brain areas instructs cardiovascular control centres in the brainstem to elicit changes in autonomic activity. Among other changes, cardiovascular control centres send signals via nerves to the heart to increase the rate and strength of heart muscle contractions. This enhanced cardiac output helps oxygenated blood reach peripheral muscles. Researchers have identified numerous brain areas involved in central command. Some areas recruit muscles and sympathetic activity at the same time; others recruit sympathetic activity according to a person's feelings of exertion, and the role of many more areas is unclear. All contribute to the brain's prediction of exercise intensity and its corresponding output of sympathetic activity. Neural areas such as the hypothalamic and mesencephalic locomotor regions (HLR and MLR) and the basal ganglia display the traditionally defined properties of central command (Green et al., 2007). They recruit sympathetic activity that matches their recruitment of muscle fibres. For instance, when researchers stimulate the HLR of a decerebrate cat, the cat begins to walk and to exhibit “appropriate alterations in breathing, sympathetic nerve activity, blood pressure, and heart rate” (Saltin, Boushel, Secher, & Mitchell, 2000). As these authors note, stimulation continues to evoke these cardiovascular and respiratory changes when the cat is paralyzed (fictive locomotion). These experiments give strong evidence that central command mediates autonomic adjustments without feedback from the exercising muscles. It is not yet known whether these midbrain structures act as relay stations or in more primary roles (Green et al., 2007). In general, these regions seem to predict that each newly active muscle fibre will require a given amount of oxygen, and thus they activate a given amount of extra sympathetic activity. Other components of central command anticipate the body's needs based on a person's perception of his own exertion. In this case, sympathetic activity and muscle recruitment do not always go hand-in-hand. In fact, they can be completely uncoupled. It was proposed as early as 1913 that heart rate, blood pressure, and ventilation could be altered “by manipulating the subject's perception of exercise” (Green et al., 2007). Williamson et al. (2006) describe studies in which hypnotized or paralyzed subjects believed that they were exerting effort to grip a rod. In reality they never moved a muscle, but their heart rate and blood pressure increased as if they had. In a modification of the traditional definition, these authors propose that central command can be separated into “central cardiovascular command” and “central motor command.” The brain can order cardiovascular changes independently of motor commands, and as demonstrated by the above studies, the cardiovascular changes can occur in response to a person's subjective feelings of exertion. In agreement with the hypothesis that “sense of effort” could be acting as feedback during real exercise, subjects report feeling more exertion as they exert more force (Williamson et al., 2006). Therefore a person's feeling of exertion could be providing a rough estimate of how much energy his muscles are expending and how much oxygen they need; in consequence, a greater feeling of exertion would prompt central command to command an increase in sympathetic activity. Using neuroimaging and other techniques, investigators have identified many brain structures that take part in central command (see Fig. 3). Pertaining to the discussion above, Williamson et al. assert that somewhere in the brain there must be an anatomical structure or network of structures that is “capable of interpreting an individual's sense of effort and making appropriate autonomic adjustments” (2006). These authors conclude that the insular cortex and the medial prefrontal cortex are the most likely “effort-interpreters” of the brain. Parts of these cortices interpret effort based on peripheral signs of effort such as blood pressure, metabolite build-up, or somatosensory feedback. Other regions of the insular and medial prefrontal cortex show no response to peripheral signals; these regions act only in a feedforward manner (Williamson et al., 2006). For instance, “imagined exercise has … been shown to cause insular activation, but only when the imagined effort elicited cardiovascular responses” (Williamson et al., 2006). Here we see that the imagination of exercise somehow stimulates the insular cortex, which then plays a role in converting this sense of effort into a change in blood pressure, heart rate, etc. Other studies have looked at the connections that the insular cortex makes with the rest of the brain (see Fig. 3). Among these are links with the medial prefrontal cortex, the hypothalamus, and cardiac vagal motor neurons (Williamson et al., 2006). These connections are likely of importance in the feedforward control of the autonomic nervous system: the medial prefrontal and insular cortices may work together to interpret sense of effort; the insular cortex may also partially control the midbrain locomotor regions and the withdrawal of vagal tone that initially increases the heart rate during exercise (Green et al., 2007; Williamson et al., 2006). This network involving the insular cortex is only part of the central command system. Recordings from depth electrodes in humans show that the periaqueductal grey area (PAG) could also be involved in central command: neural activity in the PAG shows a power increase when subjects anticipate exercise and also experience increases in heart rate, blood pressure, and ventilation (Green et al., 2007). Motor, premotor, and supplementary motor areas could also be involved due to activity during both real and imagined exercise (Green et al., 2007). Research continues to bring to light the precise functions and interconnections of central command structures. We have now seen that central command can alter autonomic activity in proportion to muscle recruitment or in proportion to a person's subjective sense of effort, that both these processes could help central command to predict exercise intensity, and that numerous brain regions are involved. The baroreflex, by contrast, is much less complex: it is a powerful feedback system that keeps blood pressure within an appropriate range at all times. Receptors in the carotid sinus and aortic arch incur mechanical strain with each pulse of blood from the heart. These receptors are wired to the nucleus of the solitary tract (NTS) in the medulla, and they send a continuous signal to the NTS based on the blood pressure they sense (Widmaier et al., 2006). In the medulla, the incoming signal is compared to the expected signal. When the actual signal differs from the expected, blood pressure is outside the acceptable range. For example, when blood pressure goes up, the baroreceptors send a stronger signal to the medulla. Autonomic control centres then reduce sympathetic activity to the heart and to the vasculature (Degtyarenko & Kaufman, 2006). The ensuing reduction in heart rate, myocardial contractility, and vascular tone leads to a lower blood pressure. In this manner, the baroreflex quickly counteracts a rise in blood pressure. During exercise, the baroreflex must be reset so that it allows blood pressure to rise above the normal range. Research by Degtyarenko & Kaufman (2006) shows that central command and the exercise pressor reflex act together to reset the baroreflex to a higher operating range. They found that central command and the exercise pressor reflex send input to the same barosensory cells in the NTS, and that a stimulation of either the MLR or the type III afferents of the exercise pressor reflex inhibited the discharge of these cells. In other words, central command and the exercise pressor reflex detect the occurrence of exercise, and they inform the baroreflex of the necessary change in blood pressure. The baroreflex continues to regulate blood pressure as during rest, but it allows blood pressure to rise to a new level appropriate for the intensity of exercise. Like the baroreflex, the exercise pressor reflex informs the brainstem of physical conditions in the body. Unlike the baroreflex however, the exercise pressor reflex collects information from the muscles. This information gives autonomic control centres a direct indication of how hard the muscles are working and how much extra blood they need (Saltin et al., 2000). In peripheral skeletal muscles, chemically- and mechanically sensitive receptors monitor the concentration of waste products and the amount of tension within muscle tissue. Thus, the receptors detect the intensity of exercise in a working muscle. 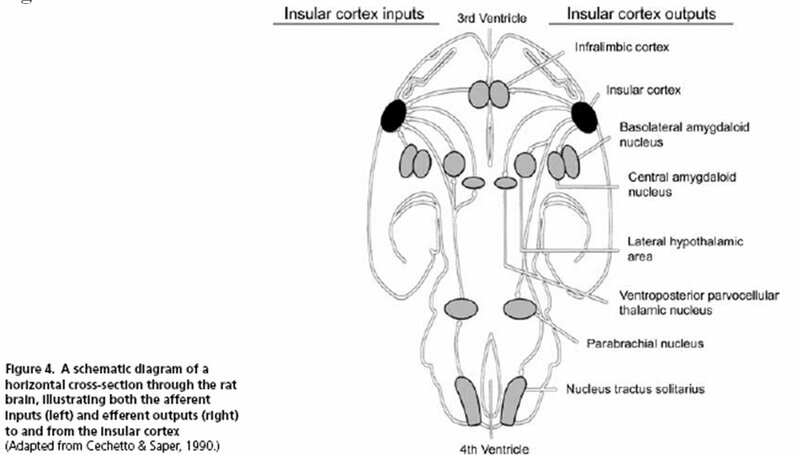 Type III and IV afferent fibres carry this message from the muscles to the dorsal horn of the spinal cord, where ascending neurons relay the message to autonomic control centres in the medulla (Smith, Mitchell, & Garry, 2006). Subsequently, autonomic nerves travel down from the brainstem and elicit coordinated changes that increase the oxygen supply to working muscles. The metabolically and mechanically sensitive receptors provide the feedback that initiates the exercise pressor reflex. From the feedback of metabolic afferents, the brain can infer whether current peripheral blood flow is bringing oxygen and removing wastes at a rate that matches metabolic demand. Metabolic receptors operate on the general principle that harder-working muscles produce more chemical products of metabolism. Detecting a higher concentration, the metabolic receptors signal the brainstem via their type IV afferents. These receptors are located on the luminal surface of arterioles, capillaries, and venules (Kaufman & Hayes, 2002) or within interstitial tissue close to blood vessels and lymphatics (Sinoway & Li, 2005). Metabolic afferents are well situated to sample the metabolites that accumulate in muscle. Early research found that something produced in muscles must be stimulating sympathetic activity during exercise. When the blood flow in and out of a limb was blocked following exercise, heart rate and systemic blood pressure would remain high until the occlusion was removed (Sinoway & Li, 2005). Since voluntary effort had stopped, central command was not responsible for the effect (Iellamo, 2001). This indicated that trapped metabolites were signalling the brainstem and mediating the sympathetic response (Saltin et al., 2000). Further research shows that when muscle contraction begins, there is a delay of five to thirty seconds before metabolites activate type IV afferents (Kaufman & Hayes, 2002). There has been much speculation regarding the type of metabolites that elicit the metaboreflex. The debate is not fully resolved. Various studies have found that metabolic receptors respond to lactic acid, potassium, bradykinin, archadonic acid, Prostaglandin E2, and a mimetic of thromboxane A2 (Kaufman & Hayes, 2002), as well as H+, K+, adenosine, and ATP-analogues (Smith et al., 2006). A few type IV afferents also respond to serotonin and histamine in high doses, but the response was too low to be of great importance (Kaufman & Hayes, 2002). Half of type IV afferents also show heightened activity when the oxygen supply is low (Saltin et al., 2000). Based on unclear stimuli, metabolically-sensitive receptors are responsible for sampling the blood to judge the effectiveness of current blood supply and to modify the autonomic output as needed. Unlike metabolic receptors, the mechanically-sensitive receptors of the exercise pressor reflex detect physical strain in contracting muscles. Mechanically-sensitive receptor endings are located close to collagen tissue in the interstitium (Sinoway & Li, 2005). These receptors drive the mechanoreflex just as metabolically-sensitive receptor endings drive the metaboreflex. The mechanoreflex utilizes predominantly type III afferents. Studies show that type III afferents increase their output in proportion to peak muscle tension (Kaufman & Hayes, 2002). This means that stronger muscle contractions evoke a stronger sympathetic response. Besides general sympathetic effects, the mechanoreflex may also play a special role in the regulation of renal blood flow during exercise. As discussed by Sinoway and Li (2005), the kidney takes up one quarter of the human blood supply at rest; during exercise, sympathetic activity directs some of this flow to the skeletal muscles by constricting renal vessels. Studies have shown that the amount of renal sympathetic activity is related to type III afferent activity (Sinoway & Li, 2005; Ursino & Magosso, 2003). The mechanoreflex responds more quickly than the metaboreflex (Rowell & O'Leary, 1990). When exercise begins, type III afferents are active 200 milliseconds after the first contraction (Kaufman & Hayes, 2002). Type III afferents respond to tetanic, static, and twitch muscle contractions, as well as to passive stretch. During static contraction, the type III response diminishes as the muscle fatigues (Kaufman & Hayes, 2002). Some type III afferents can also respond to potassium and lactic acid in physiological concentrations (Kaufman & Hayes, 2002). Overall, the mechanoreflex helps inform autonomic control centres of how much work the muscles are doing. With all the above information in mind, we can answer our initial question. How does the body make autonomic adjustments in proportion to exercise intensity? Overall, central command guesses at the necessary level of autonomic activity based on muscle recruitment and feelings of exertion, while the baroreflex corrects for errors in blood pressure and the exercise pressor reflex corrects for errors in muscle blood flow. These systems work together during exercise to ensure that tissues with an increased rate of metabolism receive the supplies they need without putting undue stress on the rest of the body. When the student running up Mount Royal took her first step, central command ordered a withdrawal of vagal tone from her heart. Two hundred milliseconds later, mechanically-sensitive receptors sent a message to her brainstem informing autonomic control centres of muscle contractions. Twenty seconds after that, metabolically-sensitive receptors in her legs detected an increased concentration of metabolites. When the hill became steeper, she began to feel a sense of exertion, and central command ordered a further increase in sympathetic activity. Sympathetic activity continued to increase as her brain recruited more motor units, as her muscles burned more oxygen and produced more metabolites, and as she picked up speed and contracted her muscles with more force. Central command and the exercise pressor reflex reset the baroreflex to allow a rise in blood pressure. Her increased ventilation brought in more oxygen; her higher cardiac output sent this oxygen to hard-working muscle cells; her constricted splanchnic circulation ensured that blood pressure would not drop, and her sweat kept her body temperature cooler. Much is still unknown about autonomic regulation during exercise. Studies have not resolved the roles of different brain areas in central command, or the metabolites responsible for the metaboreflex. As always in human physiology, many marvels have yet to be uncovered. Degtyarenko, A. M., & Kaufman, M. P. (2006). Barosensory cells in the nucleus tractus solitarius receive convergent input from group III muscle afferents and central command. Neuroscience, 140(3), 1041-1050. Freeman, J. V., Dewey, F. E., Hadley, D. M., Myers, J., & Froelicher, V. F. (2006). 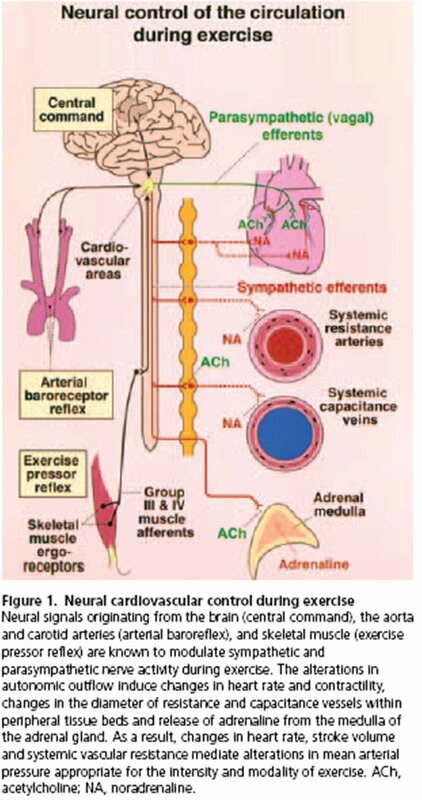 Autonomic nervous system interaction with the cardiovascular system during exercise. Prog Cardiovasc Dis, 48(5), 342-362. Green, A. L., Wang, S., Purvis, S., Owen, S. L., Bain, P. G., Stein, J. F., et al. (2007). Identifying cardiorespiratory neurocircuitry involved in central command during exercise in humans. J Physiol, 578(Pt 2), 605-612. Iellamo, F. (2001). Neural control of the cardiovascular system during exercise. Ital Heart J, 2(3), 200-212. Kaufman, M. P., & Hayes, S. G. (2002). The exercise pressor reflex. Clin Auton Res, 12(6), 429-439. Rowell, L. B., & O'Leary, D. S. (1990). Reflex control of the circulation during exercise: chemoreflexes and mechanoreflexes. J Appl Physiol, 69(2), 407-418. Saltin, B., Boushel, R., Secher, N., & Mitchell, J. (2000). Exercise and circulation in health and disease. Champaign, IL: Human Kinetics. Sinoway, L. I., & Li, J. (2005). A perspective on the muscle reflex: implications for congestive heart failure. J Appl Physiol, 99(1), 5-22. Smith, S. A., Mitchell, J. H., & Garry, M. G. (2006). The mammalian exercise pressor reflex in health and disease. Exp Physiol, 91(1), 89-102. Ursino, M., & Magosso, E. (2003). Short-term autonomic control of cardiovascular function: a mini-review with the help of mathematical models. J Integr Neurosci, 2(2), 219-247. Widmaier, E. P., Raff, H., & Strang, K. T. (2006). Vander's human physiology : the mechanisms of body function (10th ed.). Boston: McGraw-Hill Higher Education. Williamson, J. W., Fadel, P. J., & Mitchell, J. H. (2006). New insights into central cardiovascular control during exercise in humans: a central command update. Exp Physiol, 91(1), 51-58.